An in depth description of advanced methods of improving performance in health care, with an emphasis on data acquisition and analysis. 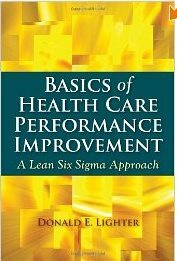 Detailed descriptions of each performance modality, as well as topics like care management and use of Lean Six Sigma for practical applications, provide the basis for the work of quality practitioners and medical policy developers to take their organizations to new levels. This textbook provides LSSGB and LSSBB basics, including use of data for informed decision making. Using the DMAIC framework, the book explains the tools used in each phase of LSS performance improvement and includes practical examples and exercises. The book serves as a great tutorial for LSS training, but also can serve as a practical reference resource for those LSSGBs and LSSBBs who need a “quick refresher”. A broad overview of quality management in health care, with chapters devoted to control charts, LSS, Baldrige framework, and a view of coming trends in the health care industry that will help readers understand the broad framework in which quality has become an important driving force.